We are going to give you some advice on how to train on snow from our experience. We hope you'll find useful information. Click the links below to read the advice! On snow covered roads or frozen roads, you need a pair of studded tires in order to ride safely and comfortably. There are many types of studded tires. Some of them have many studs and some have few studs. It is natural that the more studs you have, the less skiddy they are. But tires which have more studs are heavier. We use tires with studs designed for motorbikes. Those tires are more efficient but heavier than the tires equipped with studs designed for bicycles. The tires with bicycle studs are lighter and more comfortable when riding on asphalt. So it would be better to choose types of studded tires according to your purpose. If your riding is very aggressive, you better choose tires which have four lines of studs and designed for muddy road condition. The road often gets muddy with soft snow during the winter, so you should prepare for muddy condition. Besides, you can compensate the difference of speed among your training partners using studded tires of varied number of studs. When who is strong uses tires with many studs, he/she rides less fast and contrarily, when who is not strong uses tires with few studs, he/she rides less slowly. So you can ride together even your capacity is very different compensating it with the weight of tires. However, if you use the same tires, the difference of capacity will be bigger than in summer. In addition, you should pay attention to your pedalling revolution. It is not easy to maintain high revolution rate with studded tires as they are heavy. So you should keep your revolution around 110 per minute. Bikes with which we ride during the summer are road racing bikes. With a road racing bike, it's very easy to ride at 60 or 70 km/h and we should not ride on streets in residential districts as it is too dangerous. However, with mountain bike equipped with studded tires that we use in winter, we cannot reach a high speed because of the heavy tires. If you ride 40km/h with a road racing bike, you will probably ride more slowly than 30 km/h with MTB equipped with studded tires. So we can ride on streets in residential districts safely with them. In addition, in winter, it is dangerous to ride on trunk roads as roads become narrower and many cars pass there. But on the streets in residential areas, the traffic is very light and road condition is often good. Moreover, you can avoid strong and cold seasonal wind as houses block it. But you should pay attention to unexpected pedestrians and so on. What is most important during the winter training is the road type handlebar. We keep saying the 90 % of locomotion of road racing bikes depends on the upper part of the body. It is difficult to use your upper part of the body efficiently with MTB handlebar. So you could lose your strength of upper part of the body training with it. In order to avoid that, it'll be better to set a road handlebar on your bike. That will allow you to keep your strength and make you even stronger. However, it is not easy to set up road handlebars on MTBs. MTB frame is designed for the strait handlebar. So you should calculate its dimension so that your MTB frame fits your body and you should compensate your brake lever ratio with an adaptor if you use V type brakes. A MTB equipped with a road handlebar is called "road racing bike for snow". The training at night is fun. In summer, we seldom ride at night because it is dangerous. But in winter, as we have snow on roads, the surface of roads is bright even at night reflecting faint light. And at night, with high beam light, you can recognize unevenness on snow covered roads more easily than in daytime. It's difficult to distinguish the unevenness on the roads in the daytime as everything is white. The reflected sunlight is very strong on the snow. So it's better you use goggles with polarising lends. And goggles should have larger ventilation than summer. Because in winter, the goggles get fogged easily because of temperature differency. Choice of cloth is very difficult in winter. What is essential is that you always wear double, triple or more, double shoes covers, inner gloves under the winter gloves, multiplex high performance underwear and so on. If you possess a Wind Stopper, you would not need to wear many underwear. A face cover will be needed if you train when the temperature is lower than minus 20 degrees Celsius. You can use a face cover designed for skiing. But in this case, you should cut out a mouth hole so that your breath doesn't fog your goggle. As the hands and the feet are far from the heart, they easily get cold. In this case, you better swing your arms and legs to bring the blood to the end of the hands and the feet with centrifuge force. But you should pay attention so that you don't hit your hands and feet to any part of the bike. Hitting the bike could injure you. Normally, high grade MTB pedals don't have those problems but some pedals have. The snow blocks the binding system. In order to prevent that, you can use ski wax between the pedals and cleats. The tire air pressure depends on one's own preference. There are people who put in the tires only 1.25 or 1.5 bars in order to absorb the vibration from the road. But such a low pressure doesn't allow the studs to grasp the ice. So you need more pressure to be sure of grasping the ice on the road surface. And low pressure could cause bursts to the inner tube in the proximity to valves (especially those of front tires). Tesseract usually puts 2.1-2.7 bars (0.21-0.27 MPa) in the tires. When the road is bumpy, he puts 2.2 bars. We recommend using shoes for road bikes because you can reduce snow blocking troubles using MTB cleats which are smaller. And as shoes for road bikes are smaller, you can use many types of shoes covers. It would be an advantage when you put shoes cover double. You shouldn't forget to close the ventilation situated on the sole if you have. The cold air enters throught there if you forget to close it. Here switchback doesn't mean switchback roads or any railway system. You might feel cold on the descent even you wear enough when it's extremely cold. In this case, it'll be better not to descend up to the foot of the mountain directly. For example you descend 2 kilometres and you climb 500 metres to warm up and you repeat this action until you reach the foot of the mountain. This technique is called "Switchback". The standard cornering in winter is that you do not incline the bike a lot but you incline your body a lot so that the studs seize the ice on roads as much as possible. And also you can enjoy cornering putting out your interior foot out of the pedal and doing drifting. When roads are wet or it sleets, your bike gets wet and if you park your bike, the water on the bike will be frozen and the derailleurs will be frozen as well. In order to avoid that, you should put the rear derailleur on the top gear and the front derailleur on the inner gear so that you can recover the derailleurs with wire tension. Substance in bottles gets frozen when the temperature is beneath zero degrees Celsius. If you make the concentration of solutes (e.g. powder of sports drink) very high when you prepare it, it'll slow down the freezing process, so called "freezing-point depression". However, you cannot resolve the problem 100 percent with that. This is the idea of Tesseract. The idea of Mr.Takahashi is brilliant. He uses his own body heat to warm his bottles putting them into one of the pockets. We've mentioned above that it's essential to wear shoes covers double. However, rider who has big feet has difficulty in finding shoes covers which can cover over the other. In this case, we recommend half MTB shoes covers. That'll resolve this problem. There are many types of ear flaps. But the ear flaps designed for cycling are often not stylish. So Tesseract often uses ear flaps designed for skiing. But they are sometimes too hard for cycling as you have to keep the head up when riding. It can happen during the winter ride that you cannot see beyond 5 metres away from where you are because of ground blizzard. Your bike should be equipped with a bright taillight so that car drivers recognise you. But if it happens that you cannot see the roads, you cannot be sure where you are, you would better stop riding and let the blizzard go away. Ground blizzard. Can you see the bike in the photo? Border markers. We follow those when we cannot distinguish roads because of the ground blizzard. When the snow is very deep, the snow enters between the rim and the brake shoes, and when the snow is very clean, it doesn't produce enough friction to reduce the speed if you use a conventional brake system. 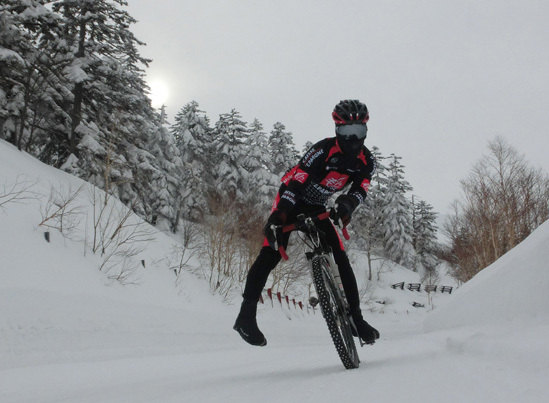 So it'll be better to equip a pair of disk brake in order to ride on snow comfortably. When you don't have enough snow on roads to ride bikes equipped with studded tires comfortably because it doesn't snow much, as alternative, there is a training on frozen rivers. When it snows much, you can't ride on rivers as snow on the ice is too deep. But, contrarily, when it doesn't snow much, the surface of river becomes hard ice. So you can ride easily on rivers. But the ice is quite slippery and if your studded tires are rubbed much, it could be dangerous as they don't grasp the ice. Even they are new, you have to pay attention. Besides, there are people who make holes on the ice for fishing. So you have to be careful so that you don't fall into. Moreover, you have to make sure if the ice can hold your weight before you ride on ice. Underwear is a very important part of snow cycling. It must be warm and dry. Recently there is cloth which keeps warm by trapping moisture from the body and converting it into heat. This type of cloth is good for peripheral parts like hands and feet. But it's bad for trunk of the body. It warms too much causing too much sweating. This sweat chills the body and deprives body heat bringinng about hypothermia. For the trunk of the body, you better use underwear which keeps warm and dry like rhovylon or zeo-line. Inverted Y desccent is a technic you use during the downhill on roads with muddy snow surface where the studs are of no use. Because of the inverted Y shape frontal projection, it's called "Inverse Y Descent". You put one of your legs outwards and give the rotation force to the bike towards the other side. The direction and the force of skid of your tires become regular and stabilised. Then it becomes easier to control the bike.